Students in the online School Business Management master’s degree program in the Department of Leadership, Educational Psychology and Foundations (LEPF) recently came together for a rare face-to-face class and toured three state-of-the-art facilities: DeKalb High School, Sycamore Middle School and North Grove Elementary School in Sycamore. A unique feature of this online cohort is that it occasionally meets in-person, giving the students an opportunity to interact with faculty and each other to strengthen relationships as well as provide hands-on field experiences. These schools were selected for the field experience for a number of reasons, LEPF chair Charles Howell said, including their up-to-date technology, extensive space for the arts and athletics, space for the community, access control and various arrangements that prevent overcrowding. 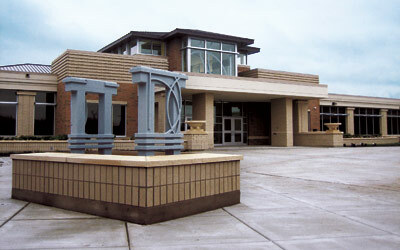 Officials and architects designed and constructed these renovated or newly constructed facilities with an emphasis on student development and safety, as well as community needs. The tours were led by DeKalb High School Principal Doug Moeller and Sycamore School District Superintendent Wayne Riesen, assisted by officials holding positions like those the students will seek to attain upon graduation: chief school business official, chief financial officer, director of finance, and business manager. The experts knew a lot about how the buildings were designed and built and how they function on a day-to-day basis. Students also appreciated hearing the different perspectives offered throughout the field experience, he said. “The students and NIU professors that participated learned a great deal and better understand how fortunate the students of both DeKalb and Sycamore schools are to have such great facilities and visionary leadership,” LEPF professor Brad Hawk said. 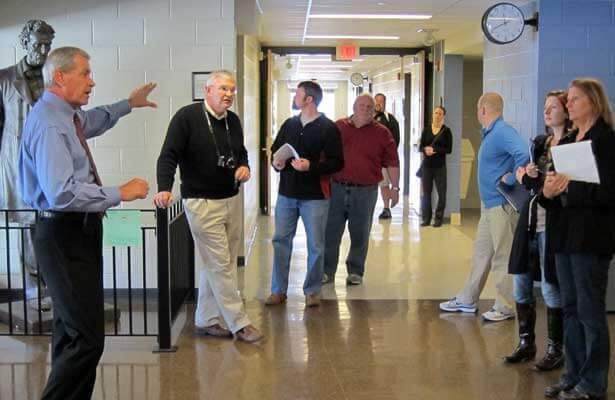 Sycamore Superintendent Wayne Riesen leads a tour of North Grove Elementary School. Jenkins not only appreciates elements of the program like the field experience, but he values the connections he established with others through the online cohort. Because of innovative programs like LEPF’s online master’s degree, NIU’s College of Education earned the distinction of being named to the U.S. News & World Report’s 2012 Honor Roll for Online Graduate Education Programs.